I was hoping to post fabulous shots of snowflakes today but, alas, while the snowfall we received yesterday was the right consistency (the light and fluffy kind), the bitter cold and gusty winds made an already difficult process pretty much impossible. (Those of you who have ever tried to shoot super-macro know exactly what I mean). 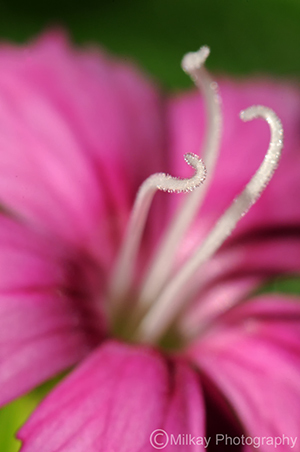 But since I already had my 3-Ring Extension Tube Set affixed to the 105mm macro lens, I went back to the Dianthus blooms to see what more of the love story those curly stamens might have to tell. Now you must realize, these flowers are the size of a US penny (3/4″ or 19.06 mm), with the stamens as small as a straight pin! Now the closer one gets, the more consideration one must pay to the tiniest of details as they will be magnified ten-fold in the resulting image. I’ll explain. Down at the microscopic level (okay, okay, they aren’t that small), life can be well, quite dusty. I didn’t notice the dust before when I was shooting with just the macro lens, but now I found myself pulling small dust bunnies off of the stamens with tweezers! Seriously! Yes, at times it can be frustrating but, if you persevere, you get a bug’s eye view into a secret world, where trials of love and betrayal play out on tiny colorful stages. They sure do look amazing, and the light so perfect too… I know the troubles of which you speak, and I’ve only done standard macro photography… Must consider getting some tubes mefinks, but I know I’d not be able to compete on the flower front. After I almost froze my fingers off outside attempting to shoot the snowflakes (wanting to toss my camera across the yard in the process), I was determined to produce something decent to salvage the day! Well, I’d say you salvaged the day!! Ah yes, the dusty flowers.. sometimes accompanied by tiny tiny spider webs too.. Been there. I really like the second shot, composition is great and I LOVE the little curly shadow too, I think that makes the shot. Well done. Hello Anna! Welcome! 🙂 Nice stuff on your photo blog! Those frost photos are amazing! Thanks so much! That curly shadow is what drew me at first and I took a TON of images at all different angles and composition trying to get the story just right. My sensor is really dirty 😦 I don’t want to send it in and be without a camera for a couple of weeks, but I’m too chicken to clean it myself. Girl, you need to get yourself to a place where they will show you how to clean your sensor and focussing screen! It isn’t that difficult and there are so many YouTube videos out there. You will kick yourself for being chicken! The dust would drive me crazy! I love how you imagine a story unfolding among the flowers – so creative. Your macro world is amazing. As you pointed out in my last macro post, those tubes certainly do make you see things you didn’t realize were there! One time, I was shooting dandelions and was totally surprised to see through my lens w/ext tubes the teeniest bug crawling all over it! I am totally getting into this story. I never thought people stacked extension tubes onto macros. If you macro goes to 1:1, where are you with the tubes attached? With that said, without the extension tubes, the 105mm has 1:1 ratio, with a working distance of 6 inches. From what I am reading in the above referenced discussion, all three tubes stacked onto the 105 supply 2.37x magnification and a working distance of around 2 inches. Downside is, AF does not work and it takes some practice maneuvering the camera in and out to get sharp images. Also, you lose several stops of light so things need to be well lit. DOF is also VERY shallow. Tripod is a must and so is remote control shutter with delay shutter release. Can get frustrating but when it works, the results are amazing! 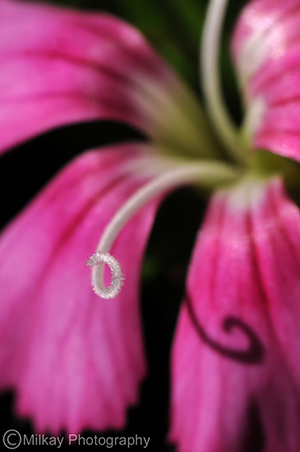 Love the selective focus on the stamens – I think I like Forgive me the best of this nice bunch. I’m all too familiar with the awful discovery that when you get close there’s lots of stuff visible that you wish weren’t there. You’ll get that snowflake image! You might want to try combining a 1.4 or 1.7 teleconverter on the macro lens along with tubes – that way you’ll get more working distance. I never thought it possible to stack a teleconvertor along with the extension tubes (and I have both the 1.4 and the 1.7)! Giving away your secrets, huh? 😉 Much appreciated! I will indeed have to try it! Do you ever have trouble with the extension tube/macro lens combo locking up and giving an F0 (F-zero) on the screen? I may have been trying to push the focus too far when this happen but sometimes I think the stack isn’t staying locked into the camera’s rings. Just another frustrating thing that occurs when I’m all set to shoot! I admire your dedication, dusting your subjects mote by mote 🙂 The detail in these shots are incredible! It’s so sad… even the botanicals are splitting up?! All My Stamens – good one, I’d watch that soap opera. I prefer the flowers to snowflakes. They remind me of a spring that I am all but ready for. very cool. you very much make me want to get all up in the business of things. the shadow is an interesting detail, too! These are beautiful macros! I think I need extension tubes on my 100mm macro. I dunno…yep. The second one, with the shadow: that’s my favorite. Outer space photos like Lynns blog,lol. What a beautiful blog you have, a nice mixture and very colourful. Thanks so much, Imac! It does look like an alien world when you get down to such a small level! that’s what keeps me going back again and again! I have only ever come up with one truly successful macro shot. I love the silvery stamens (?) of the flower! Thanks, SWK! 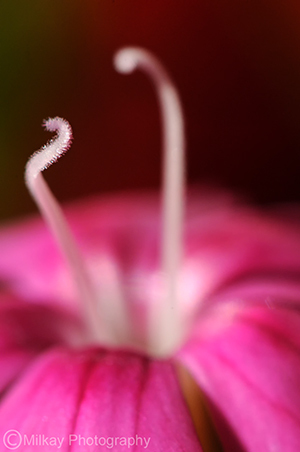 The stamens are exactly what drew me to shoot these tiny blossoms!